The Spectrum was the site of many great Philadelphia sports moments. But by the turn of the century, the building had seen better days. 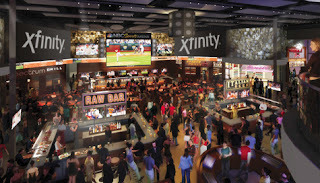 It was torn down with great fanfare in 2010, but in its place is a complex designed to entertain the masses before, during and after sporting events in South Philly and even on non-game nights - the newly opened (if awkwardly named) XFINITY Live! Philadelphia. The best news is that all of the restaurants at the complex have gluten-free menu options. The expansive outdoor area of the dining and entertainment district is centered around the XFINITY On Demand Theater, a 24-foot wide, LED video board, which will show both sports games and family-friendly movies. Adjacent to the theater, the NBC Sports Field, an outdoor miniature artificial turf field, will host numerous activities and free concerts. The Philly MarketPlace serves as a central gathering place for groups and grants guests access to each of the venues. The MarketPlace will showcase many local institutions including Goodnoe Ice Cream. Created in the essence of the Spectrum itself, the Spectrum Grill features prime steaks, chops, and seafood, and will host cocktail parties nightly. A gluten-free menu is available on request. In partnership with Philadelphia’s Victory Brewing Company, the Victory Beer Hall features elongated, beer hall-style tables, a stage for live indoor entertainment, and a 2,000-square-foot patio complete with a fire pit and a unique panoramic view of the Philadelphia skyline. Gluten-free options noted on the menu include poached pear salad, brat bites and sausages. The NBC Sports Arena offers fans a one-of-a-kind sports viewing experience, featuring a 32-foot diagonal, 6mm Sony LED HD television and high impact LED Rings displaying the NBC Sports Ticker. The menu features gluten-free choices such as salads and chicken wings. PBR Bar & Grill (that's Professional Bull Riders, not Pabst Blue Ribbon) serves Tex-Mex cuisine and hosts a country and southern rock party at night featuring a mechanical bull. You'll find gluten-free ribs and chicken on the menu there. Broad Street Bullies Pub features authentic memorabilia from the legendary Flyers teams of the 1970s. The pub will serve lunch and dinner and often feature live acoustic entertainment at night. Wings and chicken are notable gluten-free choices on the pub menu.